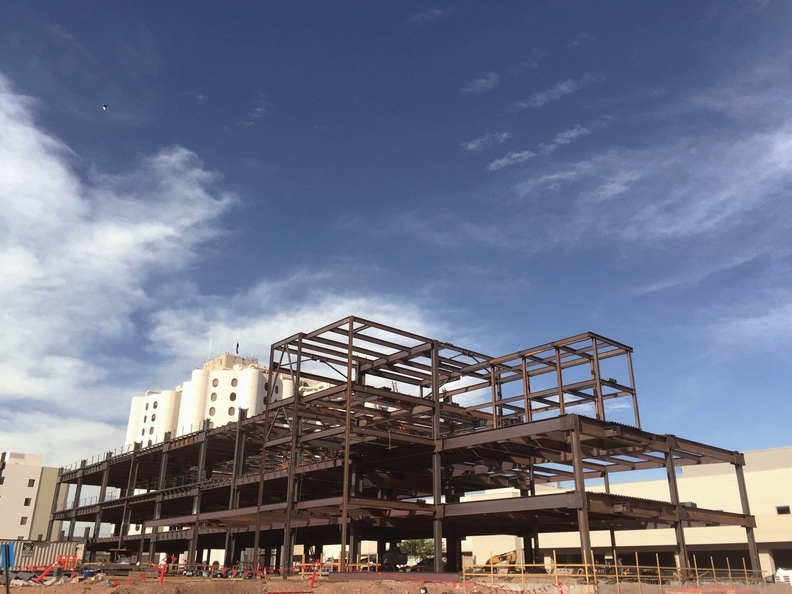 Banner Health is building a new emergency department and patient tower north of downtown Phoenix. PHOENIX—The metro area here is booming. Once-sleepy neighborhoods are seeing real estate bidding wars. New housing developments are appearing where there once was nothing. Against that backdrop, healthcare in Phoenix is reorganizing as systems compete for patients and the doctors who refer them. Just north of downtown, cranes hover next to Banner-University Medical Center Phoenix—which the locals still call Good Samaritan Hospital—where a new emergency department and patient tower are rising. With 16 stories, it will be one of the tallest buildings in central Phoenix when it opens in 2018. Parent organization Banner Health has moved into a glossy new building, across from a light rail stop, with sweeping views of the city. From its administrative offices, CEO Peter Fine points out the site of its former headquarters, a rectangular white building across from Good Samaritan that is being transformed into more than a dozen institutes for specialty care. It has been one year since Banner closed its $1 billion acquisition of the University of Arizona Health Network—including two medical campuses, a faculty practice and three health plans—and began realigning healthcare in the Valley of the Sun. Now the real work begins. Banner needs to pare away costs and overhead and modernize woefully inadequate facilities. Its neighbors, too, are watching this shift. In a city that previously lacked a university hospital, Banner wants to build an academic medicine brand. The move would cement Banner's leading position in the state and strengthen its ability to attract physicians and build new narrow-network insurance products. Yet the first order of business is to restore stability. UAHN's financial picture deteriorated rapidly in the months before the deal closed. Its Tucson campus has had five CEOs in four years. In its first 30 days, Banner poured $30 million into emergency capital for needs as basic as beds, patient monitors and blood pressure cuffs. Under the deal, Banner will invest $40 million a year in UAHN's medical schools and academic training and has committed $500 million for facility upgrades. Banner executives describe the takeover as part of its mission to be a good steward of medical education in the state. UAHN was struggling, and Banner had the resources to help. But Banner can now impose its particular stamp on UAHN, which operates the state's only two medical schools, and transform physician education. Providers in Phoenix and Tucson are working to assemble integrated networks with the stature and sophistication necessary to serve the area's fast-growing population. A newly created academic management council, with equal representation from Banner and the University of Arizona, manages the academic piece of the relationship. In her office in Banner's new headquarters, Bollinger holds up a thick spiral-bound book that's been earmarked with blue and yellow Post-it notes. “This is our bible—this is the academic affiliation agreement. Our job at the (academic medical center-level) is to bring this to life,” she said. Banner is already positioning itself for a future when it will bear financial responsibility for keeping its population healthy. About 20% of Banner's revenue is in risk-based contracts, compared with less than 5% of UAHN's. Banner has 380,000 lives covered in risk-bearing insurance products and is contracting directly with local employers on narrow-network plans. Phoenix, now home to about 1.6 million people, nearly bumped Philadelphia out of the top five U.S. cities last year, according to estimates the U.S. Census Bureau published this month. The broader metropolitan area has grown 9% since 2010. Up until last year, Phoenix was unique from other cities its size in that it didn't have an academic medical center. UAHN's Phoenix campus was only established in 2007. Resident and medical student training happened across the city's hospitals, in a spirit described as collaborative. That word is still used, but it's clear that the region's hospitals are rapidly bringing formerly independent doctors into their networks and staking their turf. Banner also is making an aggressive move in building its ambulatory-care network. That means adding access points—but it also means an internal realignment. These are the 13 specialty institutes that will be housed in Banner's former headquarters. In the past, patients might have pingponged around Banner's three dozen or so departments to treat a single ailment such as diabetes. Now diabetes and endocrinology will have a designated specialty institute. Banner has been adding physicians through employment. “We're hiring people with that DNA,” Narang said. With Good Samaritan rebranding itself as Banner University Medical Center, the system has an opportunity to create the sort of academic medical center that didn't exist last year. Phoenix's lack of a dominant university hospital opened the door for the region's community health systems to build their own research and training capabilities. Mark Slater arrived in the city in 2008 from the University of California at San Diego to run the research institute at Scottsdale (Ariz.) Healthcare in Phoenix's well-heeled northeastern suburb. It's the sort of offering that, in other cities, would operate out of the local academic medical center. Scottsdale Healthcare last year merged with the John C. Lincoln Health Network in Phoenix, and the duo subsequently rebranded as HonorHealth. Even with Banner's UAHN deal to the west, the combined system is amplifying its focus on academic training and research, launching an internal medicine residency with plans to add more specialties. HonorHealth has doubled the size of its medical group over the past 2½ years and expects to double it again in the next five. And it, too, has approached insurers and employers about creating narrow-network risk-based health plans. Closer to downtown, Dignity Health's St. Joseph's Hospital and Medical Center, the second-largest hospital in Phoenix, sits across the street from Banner's new headquarters. It has also been a teaching campus for medical students and residents. Like its neighbors, it is building a hub-and-spoke strategy in the region. In addition to its five full-service hospitals, Dignity's Arizona network includes a specialty center for neurological conditions as well as three hospitals for spine and joint surgery. The system is staking a claim in the fast-growing East Valley, and earlier this year opened two comprehensive cancer centers in the suburbs of Chandler and Gilbert. But unlike its peers, Dignity has decreased the number of physicians it employs in the state. Instead its model focuses on other opportunities for alignment, like clinically integrated networks and accountable care organizations. It is a partner with Tenet Healthcare Corp.'s Abrazo Community Health Network in the Arizona Care Network, an integrated ACO with 3,800 physicians. 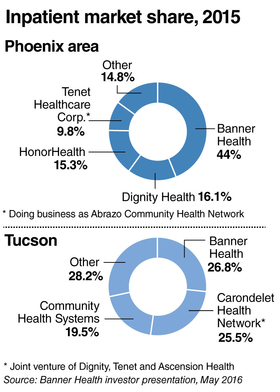 About 80% of Banner's capital commitment to UAHN, or $400 million, is going toward replacing a 44-year-old hospital in Tucson. As Phoenix's smaller, artsier counterpart about two hours south, Tucson used to be something of a rival. But now health systems are forging closer ties between the two metro areas. The UAHN takeover was Banner's first entry into Tucson. Shortly after that deal was announced, Dignity and Tenet teamed up to take a stake in the Carondelet Health Network, the Tucson-based system owned by Ascension Health. But Banner must first get the upper hand with Tucson's challenges, upgrading its outdated facilities and enticing physicians into its network. But behind the scenes, doctors are gaining access to Banner's deep resources, such as data and analytics on patient outcomes. The University of Arizona's medical colleges remain part of the university. An earlier version of this story suggested the schools themselves, in addition to the campuses, were part of the Banner acquisition.